NYPAC, the New York Performance Artists Collective, is pleased to announce Again! Again! Again!, an evening of curated performances at La MaMa Galleria on January 31st. 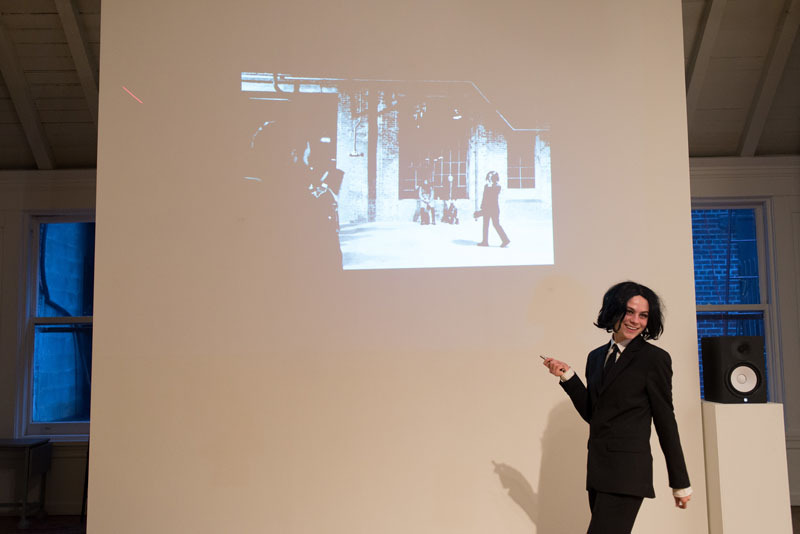 For this program, artists were invited to perform works that play with reiteration, rehearsal, or restaging. Repetition does not always aim to produce an identical outcome. When it does, it may betray a habit, a compulsion, or a sign of madness. In a performance context, repetition is often concerned with improvement: to develop a work in progress, or to salvage a prior failure. Again! Again! Again! is a loose arrangement of performances that repeat internally or across presentations; an invitation to explore the transformative potential of saying something insistently, once more. Again! Again! Again! 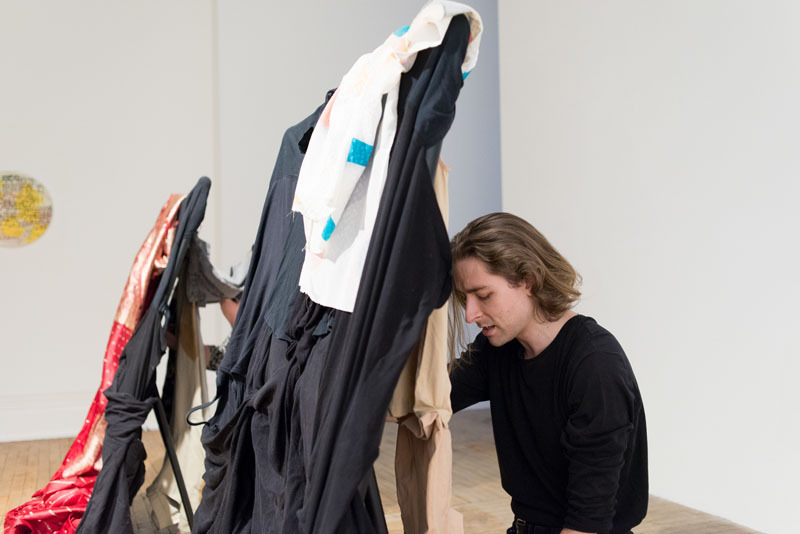 opens with maybe’s Clothes, a slippery reinterpretation of Simone Forti’s Cloths (1967), in which three performers crouch behind frames onto which layers of cloth are stapled. A tape plays of Forti’s friends singing their favorite songs as the performers intermittently sing songs and flip cloths over their frames. Clothes follows the same structure, with the elements appropriately altered: a stereo plays recordings of friends singing their favorite songs to listen to while they get dressed, while Pool and Posner flip layers of discarded clothing and sing tracks by Chaka Khan, Fleetwood Mac, Hole, and Madonna. Sara Grace Powell follows with a performance as Kelsea Wollffllotterr, the C.E.O. and spokesmodel of Develocorp. Adopting partly the format of a power point, the performance is a circuitous investigation into Wollffllotterr’s name and roles as CEO and Spokesmodel. 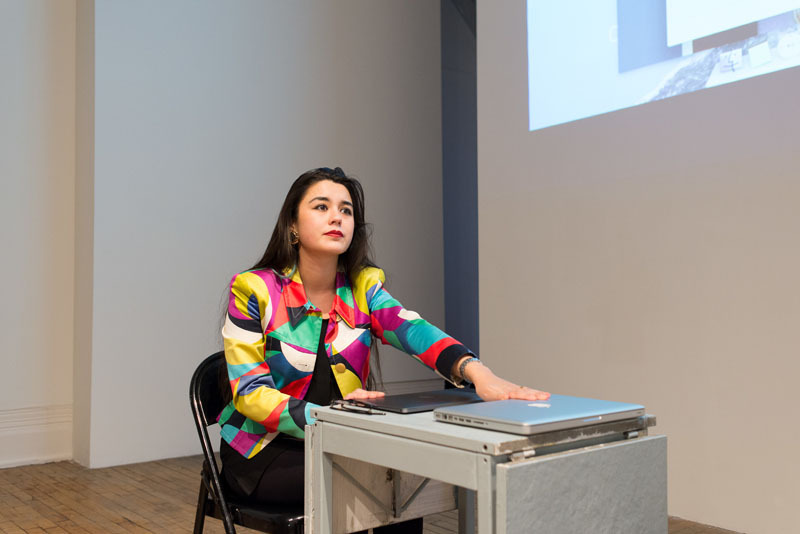 The piece explores earlier interests in twinning, displacement, and performance, and also functions as a “pre-enactment” for Powell’s upcoming performance at the Museum of Modern Art. Again! Again! Again! closes with Sophia Le Fraga’s anti-play UND3RGR0UND L0V3R5, a translation of Jean Tardieu's Underground Lovers that unfolds entirely on Twitter. The work follows Le Fraga’s W8ING and TH3 B4LD 50PR4N0, which transpire within iMessage and Gchat, respectively. As translations, the anti-plays do not attempt to seamlessly transform content into another language. Rather, as adaptations of literary text into the vernacular of the web, they cultivate a degree of confusion and misunderstanding.